It’s time to start filling in the flower beds with annuals. 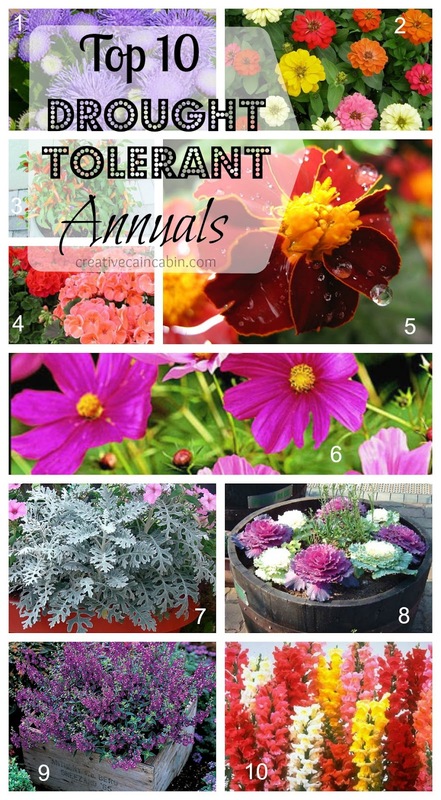 If you are one of those people who don’t have the time to devote to daily watering, then these annuals are for you. As long as you give them sufficient water soon after planting these flowers can withstand poor moisture conditions. Don’t forget to check the height of each flower variety before planting. Tall ones in the back and short ones in the front. My favorite to plant are the cosmos and zinnias. They bloom all season long and make the best, long lasting, cut flower. Dawn, thanks for this. I am probably going to buy flowers this weekend. Thanks for the advice. We certainly need drought resistant plants here in Oklahoma. This is great to know! Even though I live in a rainy part of the nation (Western WA), when we dry out, we DRY out and I get neglectful to water well enough. Thanks for the recommendations. I planted zinnia seeds and they’re starting to come up. I should have gotten cosmos. I’ve never planted them. I really want to get some. I loved all your cut flowers last year although weren’t they wild flowers? THanks for great info. We live in a very dry climate with excess alkali in our soil so we usually have to plant in containers. By some miracle we actually got lilacs this year, it’s been at least 4 yrs. since we planted them and this is first year we got lilacs. I love the fragrance, the flowers are so pretty on the bush and in a vase. Getting some use out of my pretty blue Ball jars. We live in western CO, about 18 miles west of Grand Junction. Love your blog. Love your list of the Top 10 Drought Tolerant Annuals, but your descriptions for #1 & #9 are flipped. The Angelonia is picture #9, not #1.